FILE - Afghan president Mohammad Ashraf Ghani speaks during a press conference at Presidential Palace in Kabul on June 30, 2018. Earlier Sunday, Ghani announced a three-month unilateral, conditional cease-fire with the Taliban, hours after authorities confirmed the Islamist insurgency overran a northern district and apparently captured dozens of government soldiers. Ghani explained Afghan forces will halt their operations from Monday, provided the insurgents reciprocate and respect also his truce. FILE - Afghan Taliban militants stand with residents as they took to the street to celebrate a cease-fire on the outskirts of Jalalabad on June 16,2018. Sunday's government peace gesture followed fighting in northern Faryab province. Fayiq would not discuss the fate of the government forces.Local media reported around 100 Afghan security personnel are missing. 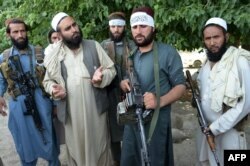 A Taliban spokesman claimed its fighters entered the district without facing resistance from government forces. He added Afghan security forces "welcomed and joined hands" with the insurgency. 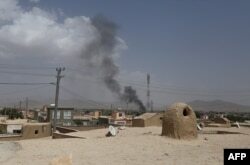 Smoke rises into the air after Taliban militants launched an attack on the Afghan provincial capital of Ghazni, Aug. 10, 2018. Meanwhile, a U.N. statement on World Humanitarian Day warned attacks against aid workers in the country this year have increased by 20 percent, with 23 killed, 37 injured and 74 abducted.It said during the first six months of this year, 1,692 civilians were killed by conflict, the highest number in the past decade.